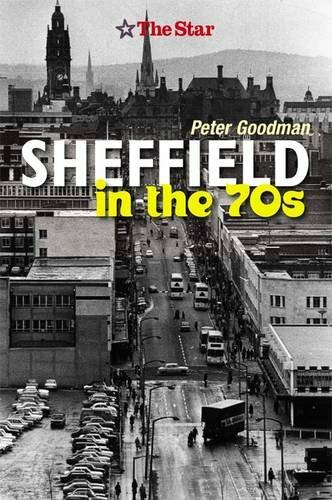 Another book we can highly recommend is this one detailing Sheffield in the 1970's and loads of photographs to look at of times gone by that I'm sure you'll remember! 400 captivating photographs chronicling Sheffield through the 1970s. It documents people and events as well as the expected photographs of buildings, streets and landscapes. Welcome to Sheffield in the Seventies! Neither will they recall the days before the Parkway linked the city to the MI or the industrial problems and power shortages which led to television having to finish at 10.30pm and motorists not being able to drive over 50mph. Not to mention Billy Smart's circus, Yorkshire playing cricket at Bramall Lane football ground and the sheer artistry of Tony Currie and Willie Henderson as they thrilled crowds at Sheffield United and Wednesday respectively. The early Seventies were the days when T-shirts came without slogans and it was legal to drive without seatbelts. Streakers ripping their clothes off at sports events hadn't been heard of. And it wasn't until 1970 that you were allowed to vote at 18 instead of 21. The decade wasn't without its freak weather either. In 1975, snow actually stopped play at a cricket match - in June! Then followed two of the hottest summers in memory. What nobody noticed halfway through the decade was a 19-year-old computer whiz called William Henry Gates dropping out of college in America in 1975 to start his own business. He was a bit quicker than the rest of us and finished up a billionaire before he was 30. Even this briefest of reviews of the things we lost and gained in the Seventies serves as a reminder that time has rushed on, played tricks with our memories and persuaded us that from then to now was a mere cockstride. So enjoy looking back to Sheffield in the Seventies and the many photographs which reflect that era. There are hundreds of identifiable faces in the book - and yours might just be one of them. Do you mean the old Esseldo cinema, half a mile from Lane Top, down Barnsley Road, towards Ecclesfield? Or was there another cinema up there? The Esseldo was replaced by a modern multiscreen cinema, but I couldn't say when. Late 70s at the earliest. There was also a second Esseldo on Herries Road, on the parade of shops, a short distance from Longley Park, and the Northern General. The cinema was originally opened in the late 1930s as the Capitol...During the War it also saw some live entertainments including at one stage a circus complete with a rather smelly elephant. It became a part of the Essoldo group some time in the late 1950s/early 60s( with other cinemas at Southey Green and Ecclesfield). I can't recall ,after the name change to Vogue, that it ever became a multiscreen cinema but by then my local viewing days were long past. Thanks. I went past there in the mid 80s for the first time in years, and the old Essoldo had become a modern steel & glass multiscreen. The external steelwork was all painted bright red, much the same as The Gaumont in town, at much the same time. I saw 633 Squadron, The Great Escape, Grand Prix, St. Trinians, several Disney films, and many others at the old Essoldo. I've forgotten more than I remember. I remember they screened The Dambusters for one or two weeks, even though the film must have been the best part of 20 years old by then.